I cannot tell you how excited I am that Tristen commissioned the next episode of So You Want To Be A Wizard, because I was dying to find out what they had brought back with them after that strange spell went awry, and I was not disappointed. I am so surprised that I never even heard of this series before, considering how wild some of the concepts are in this book. I mean, I cover so many fantasy book and TV series that dip into the realm of the magical, how had nobody ... See More told me about these before? These kids summon a white hole! NAMED FRED! Like, what? Also they get some help from a couple other wizards who seem to know how to fix Fred's burping problem, and yet neither one of them asks what the World Gates are, and I take issue with that. 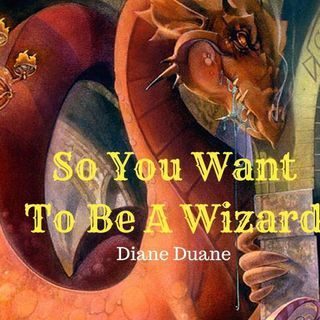 There's already another episode of So You Want To Be A Wizard recorded for next week, so stay tuned!